Trane is a heating, ventilation and air conditioning manufacturer and one of its main products is the Trane A/C XL 15i. The unit is made to allow preventive maintenance and Trane provides easy access to the unit with removable panels. This unit can encounter problems if not serviced properly. One the main problems encountered with the Trane XL 15i is the unit failing to cool the home. One reason this happens is the main breaker is off or has been tripped by the unit. Check the electrical panel where the breakers are located and determine whether the breaker controlling the Trane is in the "On" position. Another reason the Trane A/C may not be cooling is that the thermostat is not set properly. Remove the access panel to the unit and look at the thermostat on the side of the Trane. The thermostat can be adjusted by turning a knob to the desired temperature setting. Occasionally the Trane A/C XL 15i may be running, but no air is flowing through the vents and into the home. This problem can be a result of dirty air filters, which need to be changed every 30 days. Once the filters become too clogged with dirt, the airflow is restricted. Another cause for this problem is a dirty coil in the A/C unit. The coil sits at the bottom of the unit and needs to be cleaned periodically to prevent dirt from building up and causing the coil to freeze. 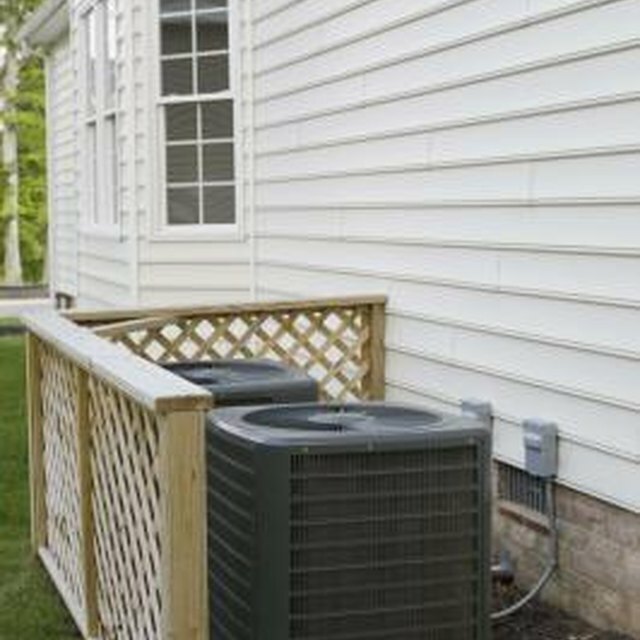 The Trane A/C XL 15i has a drain pan that allows condensation to flow out of the A/C unit and onto the ground. Dirt and debris can build up in the drain plug and cause the drain pan to overflow into the system, which can cause the motor or compressor to become wet and damaged. Remove all the debris from the drain pan to fix the problem. Another cause of drain pan overflow is that the automatic overflow switch has quit working. The switch tells the unit when to drain the pan. The only correction for this problem is to replace the overflow switch. The A/C XL 15i is not suppose to run all the time when cooling the home. The thermostat controls the Trane and once the desired temperature is reached, the system automatically turns off so it can cool down. A thermostat that is set too low during the summer will continue to run the system because it cannot reach the desired temperature. Setting the Trane A/C XL 15i at 40 degrees during the summer months is not good, because the unit cannot reach this temperature inside the home. It is best to set the thermostat at 70 or 75 degrees. A Trane A/C unit that is set at an extreme temperature can overheat and burn up, causing the need for major repairs. At What Temperature Should an Air Conditioner Be Set to Prevent Mold?